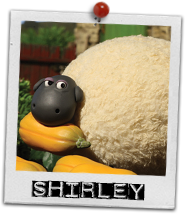 I want to give more information about my aforementioned "must see tv" about Shaun the Sheep series. If you've ever seen any of the Wallace & Grommit movies or shorts, or "Chicken Run" (the movie came out years ago), then you're familiar with the original "clay-mation" of Aardman Animations Ltd. The stories are hilarious for both adults and children, making it the perfect win-win viewing scenario! 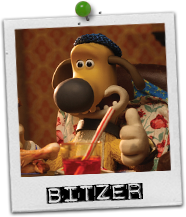 I bought one DVD last month at Target and Ben, Luke and I promptly fell in love with Shaun, Shirley (the BIG sheep whose coat is so thick things get lost in it), Bitzer the dog who basically runs the farm for the farmer, the Pigs - oh, the Pigs! I went to amazon.com and found even more of them seeing as how we are now addicted. 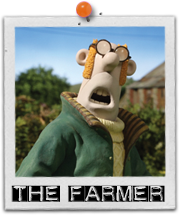 If you've ever read "Click-Clack-Moo, Cows That Type", then this is a live animation series similar to that but only with sheep on a farm in Britain. SO much fun! 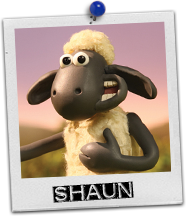 Oh...Come and bleat with Shaun the Sheep! I got a sweet phone call early this morning. The phone rang and I saw it was from my eldest daughter's cellphone. I answer with my usual (probably overly loud), "Oh, hey!" only to be met for a moment of silence. I say "Hi!" one more time and then hear Ben, eldest grandchild, start singing the theme from the Shaun the Sheep series (which, frankly, if you've never seen - you have to beg/borrow-but-not-steal/buy a copy - more about that later). 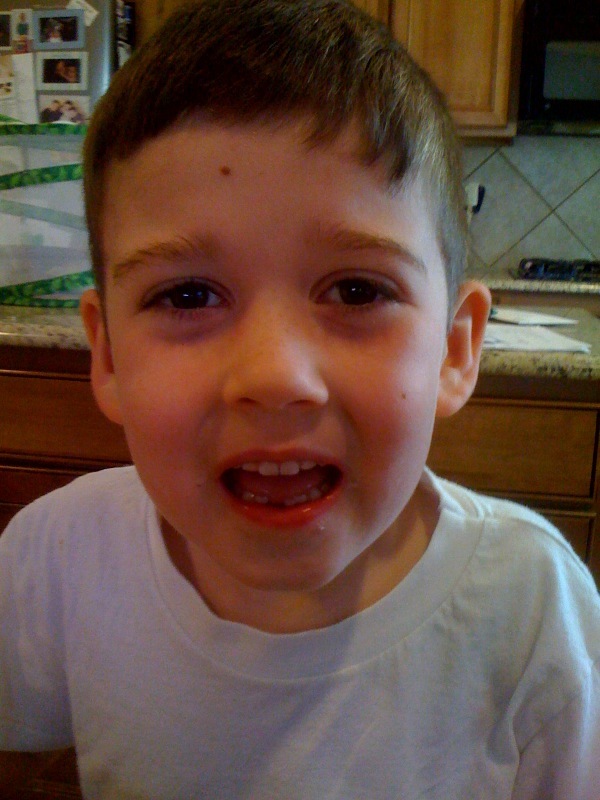 Anyway, he finishes the chorus, giggles and then says, "Gramma, I lost my tooth!" Am I actually old enough to have a grandson who is old enough to start losing teeth? Which means, of course, that Kennedy, Number Two grandchild, who is only days behind Ben in age, will be loosing them too soon. Not that I'm the type to get all maudlin about age, brown spots, crow's feet, etc. We all age - some better than others - it's inevitable and the sooner we come to grips with that (like, in your TWENTIES folks), the better for ALL concerned! But what struck me is that we are moving into New Next Generational territory. I've basked in the glow of babies in the house once again with the births of my (now six) grandchildren. I've enjoyed dressing real live dolls vs. the ones I used to buy (for those who've known me that long). I've become known by sight and name at Gymboree stores and Janie and Jack too. I can rattle off the top ten things to buy for a new mom today that are trendy, fun and functional - actually TESTED in the homes of my own children! I'm a Hot Gramma Commodity! But losing teeth. That's way beyond babies and toddler-hood. It's school, first crushes, the LITTLE Lego bricks, reading. So much more. And, like every parent/grandparent before me, I ask myself, "Am I ready for this?" He obviously is. And I'd better get on board. I have much to offer my grandchildren (and I don't mean just in the Visa or Amex arena). I need to be thinking, planning, executing how I can help enrich their minds, their morals, their values. I want to be a gramma who gets a call from a crying teenagers who spills out, "Why are (mom, dad, fill-in-the-blank) doing this to me?" and will listen to what I say. And that starts now, has started when they were born actually. One of the best investments Mike and I can make is not in the financial markets but in the future of our grandchildren. And just like a financial plan, we need to be focused, know the risks, weigh the outcomes and MAKE THAT INVESTMENT! They are precious children. And we want to do our part to help them succeed in their spiritual life, their personal relationships, their careers whether they be in the world's marketplace or in their own home. We all have influence and we need to be aware of how we wield that influence. It is so utterly important. So I've been really dwelling on this this morning as I bask in the glow of that phone call from Benjamin. God my have the "whole world in His hands" but WE have the "whole world" in our hands too when that world is our family. And like that corny ad for All State Insurance, we ask ourselves, "Are WE in good hands?" With focus on God's word and His will for us, I would say, "Yes indeed." Mike's old Dell laptop died. Actually, he literally pulled the plug on it seeing as how the plug was part of the problem. The laptop itself had been degenerating at an alarming rate for the past several months but like most things in life, we just limped along with it hoping it would hold out just that much longer. Well, HE did. If it had been MY laptop, I'd have launched a huge and full-blown campaign to replace it at the first sign of trouble. But then, I'm a Mac. And I fear he may be a PC. So I don't really have trouble with my laptop. And he always has trouble with his so probably didn't see the writing on the wall - until he really couldn't see the writing, not on the wall, but on the screen. But my intent with this missive was not to extol the obvious virtues of Macs over PCs but to say we went to Costco today to buy him a new one (contrary to my pleas to get him to consider the One True Laptop, a MacBook Pro). And as we were going to Morton's Steakhouse for a celebratory dinner this evening, decided to go to the new (well, to us anyway) Costco on Richmond near the Galleria. On a Friday evening. On a holiday. It was crowded, but laid out pretty much like every other Costco we've ever been in. But other than the very nice gentleman who helped Mike decide between the various laptops on offer, I noticed that this Costco, for wont of a better term, was "frosty". I usually shop at the Costco in Southlake, TX - near Keller where, those of you who know anything about me know, I am half the time. Lovely store, friendly people work there, even the customers are nice. and if you want the full scale "howdy-may-I-help-you" treatment, go to the one in Fort Worth. Usually we go to the one on I-10 here in Houston - they're okay. Not overly warm but not "frosty". But this one in the Galleria area? F-R-O-S-T-Y! Even the customers were "don't get in my way". I honestly don't know what the problem was - couldn't put my finger on it. But I felt it was a shame. And I also think it's a stinkin' shame that there are TWO Costco's in Houston relatively close to each other when all of us out here in the west Houston area, the Energy Corridor for Pete's sake, could really use one out this side of town (we have two Sam's Clubs, but not one Costco). I have a sneaking suspicion that if we had a Katy Costco it would rival the Fort Worth store in friendliness on both fronts - clientele and employees. So, if any of you Costco execs out there run blog searches on customer satisfaction, I hope you find this and (a) tell the Galleria Costco to loosen up a bit and smile every once in a while and (b) open a store in west Houston asap! As for Mike's new laptop, he got a great deal on an HP - and - when we went to get it from Customer Service, the box was huge causing me to question if it was the right product. Turns out we got a free printer as well. But I'd rather have a friendlier store environment personally. Yeah, I'm weird like that.